Thanks for reading this installment of drunk poetry. This will be one of many posts showcasing some of my favorite poems of all time. Stay drunk, stay writing. The metaphor of the “faithful” (or unfaithful) translation is as well-worn as that of the text going “lost” in translation. This faithfulness — or not-getting-lost — is often presented as a particular sort of pedantic, dictionary-based equivalency. This sort of equivalency might sometimes serve prose, but it generally does poetry few favors. 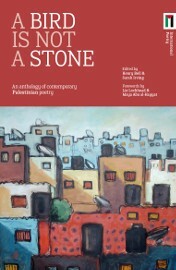 A Bird is not a Stone takes an entirely different approach to fidelity, as twenty-nine of Scotland’s celebrated poets co-translate work by twenty-five contemporary Palestinians. The works are brought not just into English, but into Scots, Gaelic, and Shetlandic.